Tyus Battle has declared for the 2019 NBA Draft. That was the news announced on Friday, one day after the Orange fell to Baylor in the first round of the NCAA Tournament. We’ve been down this road before, but this year is different. Battle returning to the Orange next year is very unlikely. With that in mind, let’s examine the legacy he will leave in Central New York. Battle is cold-blooded. That’s been pretty clear since he stepped on campus in 2016. Against Arizona State in Dayton, Battle drilled a step-back three from the left wing to put the Orange up by three with under two minutes to play. They never trailed again. With the season on the line, Battle was at his best. He went on to play all 40 minutes in each of the Orange’s four tournament games last year. In the final game of the 2017-18 season, Battle posted a team-high 19 points in a losing effort against Duke. Sometimes, though, the numbers don’t do this guy justice. He was unreal down the stretch of that season. Without Battle, the Orange likely don’t make their Sweet 16 run. Battle will be remembered for his clutch moments. The tournament run in 2018 tops the list. This was Battle’s coming out party. Down by two, with the game clock on his back, he hit one of the biggest shots of the 2016-17 season. Sure, Syracuse missed the tournament and this shot didn’t mean that much in the long run. However, it propelled Battle to the next level. From that point on, the 6-foot-6 guard was well-respected by fans and coaches around the country. On this day in Syracuse history, Battled carried the Orange, who fell short against the Seminoles 101-90 in double overtime. This might not be as pretty as a last-second shot to beat long-time rival Georgetown, but the game defines what Battle did in his Syracuse career: never gave up. He was 11-for-27 in the game. Not the most efficient performance, but he did what he needed to do. No one else on the team could hit anything. Battle basically single-handedly carrier the Orange to double overtime. 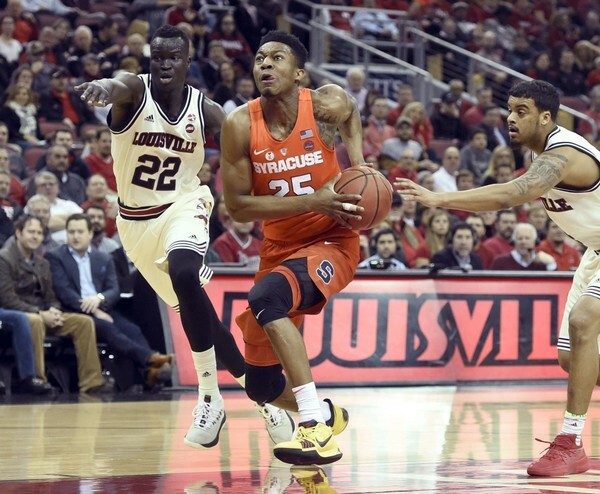 That’s what fans will remember about Tyus Battle: him doing whatever it takes to win. Even when the Orange came up short, he always left it all out on the court.